Landscapes shimmer on the walls of the Heckscher Museum in Huntington. Glowing with subtle details and powerful in their presentations, the paintings are classic April Gornik. The North Haven painter is having a solo show of her large-scale paintings at the newly-renovated museum in Huntington. The exhibition, The Luminous Landscapes of April Gornik, remains on view through July 5. 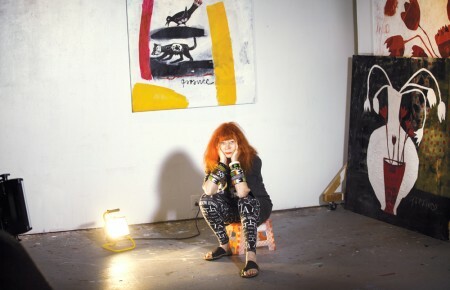 This is Ms. Gornik’s first one-person show on Long Island in 15 years. 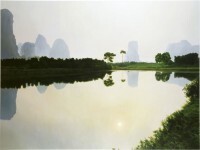 The paintings take viewers to vistas around the globe. Places like the Caribbean, China, Africa, the Southwest and the Hamptons raise their hands to be noticed in Ms. Gornik’s work. The main thing to know is that none of the paintings replicate actual vistas. Each painting leaps from pieces of photographs taken by the artist then meshed with Photoshop and her own intuitive painting process. 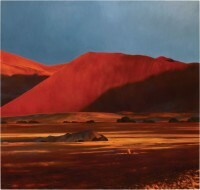 The result is paintings of places that don’t actually exist. Whether the “place” stretches for miles into the unknown or is a small slice of an intimate secret place, the viewer is on the edge of taking a step closer to experience something for themselves. 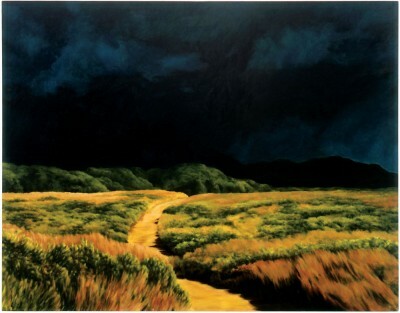 For Ms. Gornik, landscape painting isn’t about reproducing an arresting or peaceful vista with exacting realism. It’s not about the way she imbibes light in her work or the glowing aura of mystery and sometimes surrealistic touches that are part of her art. For Ms. Gornik, it’s about following her intuition and the emotional experience the painting will conjure. Her art is about beauty and about raising questions. It’s about nature through an ideal and intellectual viewfinder. Each painting is a visual discovery made in the artistic journey of creating the artwork, Ms. Gornik said. Each piece is made to consciously evoke the feeling of being inside the landscape. During an artist talk on May 2 launching the exhibition, Ms. Gornik explained she purposefully excludes people and animals to obscure the landscape’s scale. Masking scale and locale allows greater freedom for viewers to bring their own memories, emotional responses and personal interpretation to the work. The 12 paintings in the show are large. Each spans at least seven feet across and six feet wide. Their sheer mass makes it easy for viewers to realize Ms. Gornik’s goal of making people feel they are part of the painting, located at an unseen vantage point inside the landscape. This was one of the reasons Heckscher Museum chief curator Kenneth Wayne selected only large-scale paintings from Ms. Gornik’s studio. She was the perfect contemporary artist to bring into the museum’s exhibition mix, he said. He figured her shimmering paintings of lush vistas would compliment the recent renovation of the Huntington museum and present both in their best light. The museum was closed for nearly a year while the 1.5 million project was completed. The museum has a more spacious feel because of the interior renovations of the galleries and entrance foyer, Mr. Wayne said. The changes visually opens the museum and improves the natural lighting in the exhibition spaces, he said. Noticeable changes include removing a false ceiling, stripping the fabric and paneling covering the gallery walls, plastering to create pristine white walls and the installation of upgraded lighting. The museum reopened in April 2008. To prepare for the show, Mr. Wayne interviewed Ms. Gornik. As a result, each painting has wall text giving insight into the composition, its origins or how it fits into Ms. Gornik’s oeuvre of work. The paintings span from 1987 to the present, including a new work that’s never been shown before. Ms. Gornik has been exhibited in museums in the United States, Canada and West Germany. She is collected by individuals and museums, including the Metropolitan Museum of Art, the Museum of Modern Art, the Whitney Museum of American Art and the Jewish Museum, all in Manhattan. She is represented by Renato Danese of Danese gallery in Chelsea. 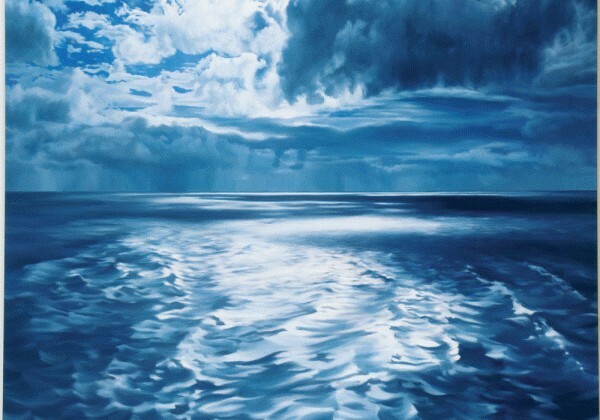 The Luminous Landscapes of April Gornik remains on view through July 5 at the Heckscher Museum of Art, 2 Prime Avenue, Huntington. Also on view in separate galleries are exhibitions showcasing art from the museum’s collection. Highlights include a show of historic etchings that includes works by Rembrandt van Rijn (1606-1669), James Abbott McNeill Whistler (1834-1903) and Hendrick Goltzius (1558-1617). Paintings in another gallery include Eclipse of the Sun by George Grosz (1893-1959) and a loaned painting by abstract expressionist Helen Frankenthaler. heckscher.org.